Why do 62 percent of AV companies say they will change rental software in the next three years? (See sidebar Executive Survey). Rental managers are often quick to blame the challenges they experience in operations process, overlooked details, lost gear, unnecessary sub-rentals, to some failure with their software. Common complaints are lack of standardization in quotes, inaccurate inventory, and poor tracking capabilities. Sales and accounting express their issues as well. Unattractive proposals, inaccurate reports, and lack of forecasting tools are the usual suspects. But in general, these problems can be easily overcome outside of the rental package. The bottom line is: a poorly functioning rental operation has no where to hide. Rental management software companies want to sell you a product and are happy to install it and show you how it works. What they are not equipped to do is revamp your operational procedures, clean up your database, or teach you how to properly run a rental operation. In addition, they don't want you discover how much more productive your current software could be for you if you just made some adjustments to your existing operation. The decision process is much like buying a new projector: define your need, make sure what you have is no longer adequate, research the options, evaluate the best prospects, and prepare your operation to apply the new technology. Here are three crucial steps AV rental operations need to take before migrating to a new rental software system, or deciding to keep the one they have. "We'll revamp operations after the new software is online," has become the rallying cry of many a beleaguered rental manager as the lure of a new system becomes an excuse to not fix existing problems. This is the reason so many software migrations end in disaster: The rental operation that can't succeed with their current software will experience very expensive failure when they try to implement a new system. Before you delve too deeply into evaluating rental software for your business, it is essential that you document your operational processes, in other words, follow an order through the system. You need to understand who handles the details, how they access resources, and where the decisions are made. Your existing rental software plays keys roles, but there are other programs and data files being used. Documentation will be more accurate and complete if conducted by someone outside of your company. An independent analyst can ask the probing questions that might be awkward or unwelcome from a fellow employee or manager. Not to mention that employees are often too close to the process and take too much for granted to capture the more arcane steps used every day. This pre-evaluation review has three important benefits. First, it will define what you need your software to do. Individuals and teams create processes to accomplish what their rental management package won't. By documenting all of these ad hoc procedures you can discover how many are redundant, how many times the same information is handled, and who would be more productive if all the information were in one place. This is also where you can discover whether you would benefit from the added costs of a more comprehensive software package. Labor planning, customer relationship management, and accounting tools are often left out of the equation because of the cost and complexity of migrating the operation to a new system. An independent evaluation of your needs should help you make a better long term decision. Secondly, this record can help eliminate what the software doesn't need to do. Too often we get drawn into the features of a package only to find later that they are never used. Real-time individual asset utilization reports sound important, but will they really help your business? If your operation has already created a work-around to address this need, then you are more likely to effectively use that feature if it exists in the new software. In short, if it is really important to you - you are probably already doing it one way or another. Finally, an operational review may reveal what is causing the frustrations you have now. It is remarkable how many rental companies only give a couple of hours of software training (if any) and then wonder why they can't get good information out of their system. Lack of formal training for new employees will quickly lead to underused or forgotten features in your current system. Making a few adjustments to existing methods might extend the life of your current rental management package and it will definitely smooth the transition to a new one. Dealing with the myriad of fixable problems is more urgent than introducing a whole new set of issues inherent in a software migration. Once you understand the features you need, it's time to check out some of the available systems. Start with the online demos. A salesman should be able to demonstrate the product via a web interface such as WebEx. Use this opportunity to understand what features the manufacturer thinks are important. Do not dismiss a product because it doesn't have a function you feel is mandatory. Sometimes the feature you think you require has been supplanted by a more practical solution. Having said that, it won't be hard to narrow the viable candidates down to a field of three to four without ever leaving your office. The next step is to talk to folks who use the products. I suggest checking out the vendor's website for client names and randomly calling firms similar in focus to yours. Ask how the support is, what features they like, and ones they wish they had. Don't be surprised to get distinctly different responses to the same product even from users within the same company. Sometimes these interviews may narrow down your choices, but the goal is to arm you with better questions for your short list of vendors. Typically you will have a camp for each product in your own company. The Accounting department will favor the one that interfaces with your current bookkeeping system. Sales will like the one that is the most flexible in building quotes. Operations wants the one that keeps better track of changes. Management wants the one that is least expensive. And everyone wants to believe whichever software salesman tells them they can be up and running in three months or less. Now is the time for more in-depth demonstrations. If you have done your research and asked the right questions, the prospective vendor should come to you. Your final evaluation team should include managers from every affected department all the way from Sales to the warehouseman that checks the gear in and out. To get an idea of the scope of the migration project, take a look at your inventory, customer, and contact databases and estimate how many entries need to be deleted or corrected. Useless records are not things you want to spend time and money moving into a new database. And while we are on the subject, the process of migrating data from one system to another is often more complicated than you want it to be. The new system will need the old data re-formatted to make it possible to import. In extreme cases this will require tedious work like separating first name, last name into two fields or putting company names in a field that is different from ones used for an individual's name. More than one company has thrown in the towel and chosen to enter new data in as they go, adding to the new users' frustrations. Customization is a big selling point for most firms. Before you start talking about what it will cost to modify a package to make it work the way you want, first make sure that you've tried everything to avoid it. The costs can be staggering and the process more frustrating than it's worth. An operation will have to make big changes to adapt to the new software anyway. Your time and effort are better spent managing the changes in your operation (where you have some control) than they are trying to develop software features. Staff training should take place in stages that allow the users to spend time using the software in between increasingly more in depth instruction sessions. Finally, document everything. Each job or function needs a user guide with graphics that explains how to correctly process information. If you only follow one of these recommended steps, make it the first one. Follow an order through your system. Every operation would benefit from a little scrutiny whether there is a migration in your future or not. At any rate, it should be apparent that evaluating and implementing software is going to take up a lot of your time and that of key personnel. Depending on the size of your operation, this could be as little as six months to well over two years! Many companies feel they can't afford to tie up those folks or that they do not have the right skills for the project. For those companies there are Consultants and Project Managers who can help. Your software vendor might have suggestions based on experiences with other customers. 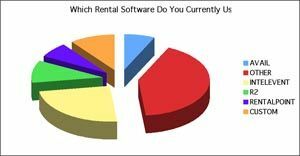 In a recent survey of R&S executives we asked a number of questions about their current rental management software solutions. Of course we asked which system they use and were surprised to find out that one-third did not use a commercial rental program at all! Many folks still used off-the-shelf database packages or accounting software to manage inventory, create quotes, and track customer information. Ten percent use proprietary systems and they were the only respondents who reported being very satisfied with performance and had no near-term plans to change. Of the 64 percent of folks who use a commercial system, half claimed they are marginally satisfied with their system and 44 percent said they are satisfied.In spite of the general satisfaction conveyed in the survey, 62 percent of all respondents plan on migrating to a new system in less than three years. 56 percent of the companies who are using commercial systems and 80 percent of the off-the-shelf users plan on changing systems in that same time period. Why would so many companies be considering such a major commitment? We asked several executives who have changed software before and plan on doing so again what their reasons were. Almost universally they replied that the software they most recently installed never actually met their expectations. This comment was not unique to any one brand and the responses from companies that migrated from product A to product B cited the same reasons as those who went from B to A. Customer service after the sale including training, support, and de-bugging were frequently cited as lacking. However, several of the executives mentioned that their companies had not put in enough effort to make the product work well.